The ms Koningsdam cruise ship is Holland America Line's newest and largest, with 1,331 cabins and suites for its 2,650 passengers. The ship includes Holland America's first-ever purpose-built family cabins and single cabins. In addition, the suites now offer more variety in size and configuration. All the cabins and suites have modern touches like USB ports and electrical outlets next to the bed, interactive television with on-demand movies, and frameless glass shower doors. The Koningsdam has five different types of suites--Pinnacle, Neptune Spa, Neptune, Signature, and Vista. The cruise ship also features eight different types of cabins--Verandah Spa, Verandah, Oceanview Spa, Oceanview, Interior Spa, Interior, Single Oceanview, and Family Oceanview. All of the suites and cabins have multiple categories that are determined by the deck and location on the ship (forward, aft, or mid-ship). The next 18 pages include photos and more information about some of the different types of accommodations on the Koningsdam. The Holland America Koningsdam cruise ship Pinnacle Suite is the cruise ship's largest suite, measuring 1,290 square feet including the veranda--the size of many apartments. The Pinnacle Suite amenities are impressive and include the use of the exclusive Neptune Lounge and personal concierge service. The Pinnacle Suite has a separate bedroom with a king-sized bed and dressing table. Adjacent to the bedroom is a dressing room, bathroom with an oversized whirlpool bath and shower as well as an additional separate shower stall. The living room and dining room combination has a sofa bed that sleeps two, pantry, microwave, and refrigerator. The suite also has a private stereo system, guest toilet, and huge floor to ceiling windows. Wouldn't you love to spend a week or more in this Pinnacle Suite? Many cruise lovers would enjoy just soaking in this private whirlpool for a few hours each day! The Holland America Koningsdam has 43 Neptune Suites measuring 465-855 square feet, including a veranda. Neptune suites also feature two beds that can be converted to a king-sized bed, dual sinks in the bathroom, full-size whirlpool tub and shower plus an additional separate shower stall, and a large sitting area. The Koningsdam has two Neptune Spa Suites located near the Greenhouse Spa & Salon on deck 10. These suites feature yoga mats and an iPod docking station. 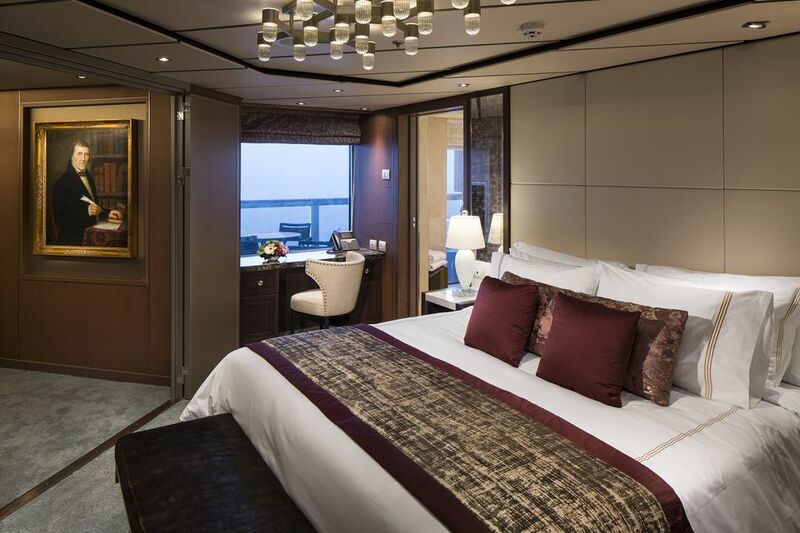 The Holland America Koningsdam has 14 Signature Suites measuring 393-400 square feet. Although these suites are smaller than the Neptune suites, they still include two lower beds convertible to a king-size bed, one pull-down Murphy bed that sleeps one person, bathroom with dual-sink vanity, full-size whirlpool bath and shower and additional shower stall, large sitting area, private veranda, and floor-to-ceiling windows. Guests staying in the Signature Suites do not have access to the private Neptune Lounge, which is only open to guests in the Neptune and Pinnacle suites. The Koningsdam has 104 Vista Suites, each measuring from 260-356 square feet. Unlike the other larger suites on the cruise ship, the Vista Suites do not have a tub, only a spacious shower. Guests staying in the Vista Suites also do not have access to the private Neptune Lounge. The two beds can be converted into a Queen-sized bed, and the suite has a sitting area. The Koningsdam has 38 Veranda Spa Cabins located near the Greenhouse Spa & Salon on deck 10. These suites measure 228-420 square feet and feature all the same amenities as the Veranda Cabins, but also include yoga mats and an iPod docking station. The Koningsdam also has 4 Oceanview Spa Cabins and 11 Interior Spa Cabins. Like the Veranda Spa Cabins, they have all the same amenities as those in their same class ​but are located near the spa on deck 10. These cabins also have yoga mats and iPod docking stations. The Holland America Koningsdam has 710 Veranda Cabins, each measuring 228-420 square feet. This is the most predominant cabin type on the cruise ship. These cabins have all the amenities found on veranda cabins on other cruise ships, but also have a lighted makeup mirror, mini-fridge, and bedside USB ports and electrical outlets. Cabins 5048, 5050, 5051, and 5053 are larger and have a slightly different layout than other Veranda Cabins on the Holland America ms Koningsdam. These cabins are turned horizontal rather than vertical, so have space for an extra window. The lounge chair and table are tucked into a corner near the sliding door, and the vanity has plenty of space. The balconies (verandas) on the Koningsdam cabins 5048, 5050, 5051, and 5053 are larger than most of the other veranda cabins. The 94 Oceanview Cabins on the Holland America Koningsdam measure 175-285 square feet. Most of these cabins are slightly smaller than the Veranda Cabins and have a window, but no balcony. The amenities are the same as the Veranda Cabins. Family Oceanview Cabins are a new type of cabin on the Holland America Koningsdam. These 32 cabins measure 222-231 square feet and can accommodate up to five guests. The cabins have everything found in regular oceanview cabins, but also have larger closet space, two lower beds that convert to one queen sized, a sofa bed that sleeps two, and one pull-down upper bed seen in the next photo. The best part of the Family Oceanview Cabins is the two bathrooms--one with bathtub, shower, sink and toilet, one with shower and sink. This extra shower and sink make family travel much easier! The Family Oceanview Cabins on the ms Koningsdam cruise ship have a pull-down bed, making the cabin accommodate up to five guests. In addition to the new Family Oceanview type, Holland America has introduced Single Oceanview Cabins to the ms Koningsdam cruise ship. These 12 single cabins measure 127-172 square feet. They are tiny, but a perfect size for one person--mostly just a bed and a bath. As seen in this photo, the Single Oceanview Cabins on the ms Koningsdam cruise ship has just enough room for a small chair and corner cabinet--no desk or large vanity table like in the cabins designed for two. The 26 Interior Cabins on the ms Koningsdam cruise ship range in size from 143-225 square feet. The interior cabins have no window or balcony but do have many of the same amenities as those types of cabins. This Category I interior cabin is one of the larger ones. The Category J cabin on the next page is one of the smaller ones. The floor space is the only difference. This Category J Interior Cabin on the ms Koningsdam is one of the smallest cabins on the cruise ship. It doesn't have much floor space but does have a small vanity/desk, a queen-sized bed that can be split into two beds, and a nice-sized bathroom.